The family had planned a reunion at Lake Tahoe for the week and I was driving up from San Jose with my brother from Colorado who had flown in the day before. Jim was really the only other family member I could describe as a hiking enthusiast, so it was no real burden to trouble him with a hike on the drive up. I had wanted for years to hike the ridge on the north side of Echo Lakes just east of Desolation Wilderness, and this would give us a chance to stretch our legs after almost four hours of driving. It was not an early start by any measure, but I didn't expect it to take too long with about 10mi RT. It had been four years since I was last at Echo Lakes and I had forgotten how crowded it can be in the summertime. Aside from a holiday weekend, we probably couldn't have picked a more popular time, arriving just before noon on a Saturday in July. We ended up parking at a questionable location almost a mile from the trailhead near the outlet of Lower Echo Lake. This is one busy place. The popular activities appear to revolve around the lake, with boating, paddleboarding, fishing and of course hiking. The lakes are located outside Desolation Wilderness, their banks peppered with more than a hundred summer cabins and homes. There are no roads reaching to the cabins around Upper Echo Lake and the west side of the lower lake, so all the materials to build and supply them must come in by boat. We started out from the dam just after noon, following the PCT as it makes its way along the north side of the lower lake. Flip-flops, bathing suits and whole families were plying the trail to reach one of the numerous swimming and fishing spots along the bank. We left the bustle of the trail after less than a mile, starting up to our ridge and the saddle between Pt. 7,758ft and Flagpole Peak. 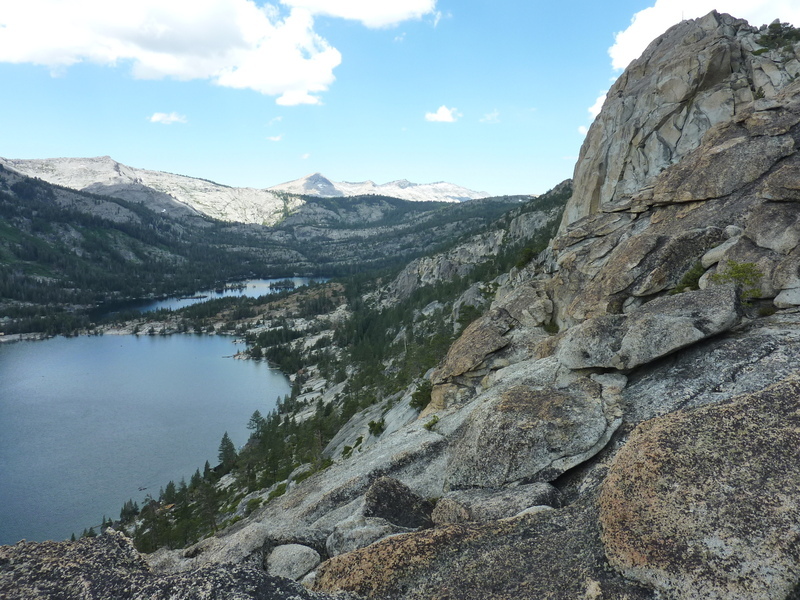 The scrambling up to Flagpole Peak via the SE Ridge is easy class 3, an enjoyable bit of climbing with fine views, not only of Echo Lakes and Desolation Wilderness, but now opening up to the north with Lake Tahoe and Fallen Leaf Lake. We reached the peak an hour after leaving the dam, finding a pole draped in old clothing and topped by a tattered US flag. While I was waiting for Jim to join me a short distance below the top, I happened to discover a geocache tucked under a few rocks nearby. I perused it while waiting, added our names and put it back before Jim had caught up. From Flagpole, we continued northwest along the ridge that soon becomes easy cross-country travel. A leisurely hour later we had found our way to the summit of Echo Peak made easier by a use trail that has developed over the years on this side of the peak. There were several parties at the top when we arrived, somewhat surprising given the lack of trail. Later I realized it is more popular than I had imagined - there is even a SummitPost page for it. The summit is a large granite outcrop that affords wonderful views in all directions. Jim asked one party where they had come from, to which they replied, "From Angora." Angora Peak was our final destination, a lesser-known peak and it seemed surprising that someone was visiting that as well. I then realized that they were referring to Angora Lakes which are found to the northeast, about 1,200ft below the summit of Echo Peak, with another use trail leading up from that side. The lakes were busy with recreational activity as well, more cabins, kayaks, and people could easily be seen around or upon the lake below. The noise of laughter, dogs barking and music could be heard wafting up from below - this was not a Wilderness experience, to be sure. Echo Peak marks the highpoint of the ridge with some 700ft of prominence, and as we continued north we began a slight descent through forested terrain to reach a point halfway between Echo and Angora Peaks. Here the easy travel ends and the ridge devolves into a sharper line with a mix of large blocks and smaller, loose talus. We went only a short distance below the intermediate point before it became stiff class 3 along the ridge. Jim asked if it wouldn't be easier to drop down to the left to bypass the sharp edge. I was enjoying the scrambling and thought the ridge probably faster (it wasn't). Jim decided to take a break and let me continue to Angora by myself. The hardest move was found just past where Jim had stopped, after which it became easier, though not easy. After leaving Jim, it took another 25min to cover the 1/3mi distance. I didn't realize there was another named point along the way (Indian Rock) or I would have tagged it rather than dropping down to easier ground just below to the right. There was no cairn, register or benchmarks atop Angora, but its proximity to Angora Lakes undoubtedly led to it being climbed numerous times from the south. I took pictures of Fallen Leaf Lake to the northeast, Mt. Tallac to the northwest and back west to the ridge I'd traversed. I could make out Jim at the local highpoint waving his poles. I waved back. He continued waving and I wondered if he was trying to signal me, perhaps that he planned to start heading back. If his wavings were semaphore signaling, it was lost on me. Another 25min later I was back at the local highpoint where I found Jim patiently waiting. Turns out he doesn't know semaphore any better than I and his wavings were just wavings. Had we a full day for the outing I had planned next to head west to Keiths Dome and then Cracked Crag, but those would have to wait for another day due to our late start. We went back over Echo Peak and followed the good use trail down towards Echo Lakes for a good distance before losing it somewhere on the steep slopes above the isthmus between the two lakes. We scrambled down more class 2-3 slopes with granite slabs and some cliff sections, and by various routes found our way back down to the PCT with only minor bushwhacking. Back at the dam we were both amused to find a young woman loaded with two packs, one on her back and one in front, while here apparent Significant Other walked behind with only a set of trekking poles. We expected she was probably training for something, but we found the sight amusing nonetheless. It was almost 5p by the time we returned to the van parked up the road, making for just over 5hrs on the day. I had expected the outing to be more mediocre but was happy to find it otherwise - not a bad way to spend an afternoon at all. Flagpole Peak is fun in winter as well; you can park at the (I think) Echo Lakes Sno-Park, snowshoe in along the road (and see cabins up to their roofs in snow), and go straight across the frozen lake, bypassing the dam.